Fatima is trying to find out who she really is – and after fifteen attempts, finally pass her driving test. Farah is happy being a wife but longs to be a mother. Bubblee is determined to be an artist in London, away from family tradition, and Mae is coping with burgeoning Youtube stardom. Yet when family tragedy strikes, it brings the Amir sisters closer together and forces them to learn more about life, love, faith and each other than they ever thought possible. To ask other readers questions about The Secret Lives of the Amir Sisters, please sign up. When Nadiya Hussain entered the BBC television competition The Great British Bake Off in 2015 she not only won the top prize but also stole the hearts of everyone who watched that series. This is her first foray into light fiction and what a debut it is! That same warmth and humanity that she showed on T.V. shines through in this novel. However it must be noted that at the beginning of the book it states that this was written by Nadiya with Ayisha Malik, and Nadiya thanks her in her acknowledgem When Nadiya Hussain entered the BBC television competition The Great British Bake Off in 2015 she not only won the top prize but also stole the hearts of everyone who watched that series. This is her first foray into light fiction and what a debut it is! That same warmth and humanity that she showed on T.V. shines through in this novel. However it must be noted that at the beginning of the book it states that this was written by Nadiya with Ayisha Malik, and Nadiya thanks her in her acknowledgements for "helping (her) through (her) writing process". The book follows the story of four sisters living in a small English village who, like Nadiya herself, have Bangladeshi roots. And what makes this a refreshing change from so many other light fiction reads is that this one focuses more on familial love than on romantic love. Each chapter follows the view point of each of the four sisters and, though at times it felt somewhat formulaic, there was plenty of wit and heart in the story to keep me interested. Each sister had both good and bad points making them feel more real, and each felt like individual characters with no one sister feeling like she was written to make up the numbers, and it was quite fun trying to decide which of the sisters I was most like myself! It was also very enjoyable reading about Bangladeshi culture in an English setting. There were no great surprises or twists to the plot and at times the characters did feel a little bit clichéd in their actions but I was never bored! The storyline was gentle but always entertaining with the Amir family dynamic providing chapters of hilarity interspersed with moments of great emotion. I very much enjoyed reading about all the different relationships between each of the sisters and their struggles to find their own way in this world. In a marketplace chock-full of light entertainment reads this one is quite a strong debut and makes me think that Nadiya has a great future ahead of her in this genre. I was really doing all I could to like this book. The first half is painfully slow with the same bland everyday themes repeating themselves over and over. Nothing really was happening? What was the story? The latter half was somewhat improved but overall this is a very disappointing read. It's being published with high expectations on the author from an adoring public who are fans of her cooking books and Great British Bakeoff success. For those feats I say bravo! This lady can make a cake! Inspi I was really doing all I could to like this book. The first half is painfully slow with the same bland everyday themes repeating themselves over and over. Nothing really was happening? What was the story? The latter half was somewhat improved but overall this is a very disappointing read. It's being published with high expectations on the author from an adoring public who are fans of her cooking books and Great British Bakeoff success. For those feats I say bravo! This lady can make a cake! Inspirational. That doesn't make you a novelist however. Sadly the book lacks fizz, especially considering the title and in so many areas of this book were missed opportunities to make a scene really something. Whilst some of the characters were endearing they were also somewhat flat and lifeless. I wanted to be reading a modern day classic! I love women's fiction surrounding family dramas and personal relationships.I found this dull with no shine, the flow stilted. I nearly gave up during the first half. I didn't enjoy my time with this novel despite wanting to like it. Hoping it would be fab. The author has no doubt put heart and soul into it (it does say it's written with another person at the front of the book?) but in comparison to much other women's fiction read this one didn't delight me one bit. 2 stars for what was a mediocre read. I'm interested to see how the public receive this book as more read it. I'm not the only one to find big parts of it dull so far. Firstly, let me make clear my bias. I am a lover of The Great British Bakeoff, and I'm still upset about the changes to the show coming for the next series and don't know how I feel about it, and one of our family favourites from the show was Nadiya, my Dad called it right at the start, he thought there was something about her and sure enough he was right. When I saw this book at the library there was very little chance I wasn't going to love it. This book is told from the perspective of the four Firstly, let me make clear my bias. I am a lover of The Great British Bakeoff, and I'm still upset about the changes to the show coming for the next series and don't know how I feel about it, and one of our family favourites from the show was Nadiya, my Dad called it right at the start, he thought there was something about her and sure enough he was right. When I saw this book at the library there was very little chance I wasn't going to love it. This book is told from the perspective of the four Amir Sisters, Fatima, Farah, Bubblee and Mae, they live in a cute little English village, Wyvernage (I am assuming this is a made up village) the girls are four of the five children of Immigrant Bangladeshi parents who made the move to England when their eldest daughter Fatima was a baby. They are the only Bangladeshi's in the neighbourhood and have done there best to fit in. Each of the girls are very different, Fatima the eldest is 30, still trying to get her drivers license and she works as a hand model ( this made me laugh so hard). Next there is Farah, she is married to her cousin and she loves her husband very much and she does her best to help and support everyone but doesn't let people in, she is feeling the pressure because they don't have a baby. Bubblee moved to London a few years ago and she is an artist who rejects the ways of the family, she wants be independent she doesn't believed in the defined gender roles of her parents and resents that her sister Farah has fallen into that trap and she could have had so much more. Finally we have the baby of the family, Mae. She is still at school and thinks she is the next big thing in Social Media, she has 5000 subscribers on her YouTube channel and records the everyday goings on of her family. Each chapter of the book is told from the characters perspectives and switches as the book goes on. A family tragedy impacts the family and there quite happy family life is rocked, and it makes them all question what they think they know about the family they thought they knew so well. The story has a few twists and turns and each of the characters are fleshed out though with four characters and only 300 pages its hard to go to much detail but the story is well fleshed out and I was interested through out. Nadiya had some help in writing the book from the wonderful Ayisha Malik and having read one of her books I could see that in this book, for a first book though it was enjoyable. Its a family comedy/drama/chicklit/womens fiction type read and I enjoyed it. I wanted a nice palate cleanser that didn't make me think to hard after finishing Exit West and this was a delight. I'm hoping that Nadiya will write another book featuring the Amir Family because there is certainly more going on there and I love me a big loud Bangladeshi family and this one is great. Light and frothy, with wonderfully illustrated, totally familiar dysfunction in each member of the Amir family. The story is centred around the Amir Sisters, living in a small English village. Fatima is in her thirties and has failed her driving test fifteen times and gains her income from being a hand model, Mae is a teenager with a Yo This book is the debut from Nadiya Hussain – the winner of Great British Bake Off 2015. I’ve noticed that Nadiya has dipped into creative writing before with her Bake Me A Story which is a recipe book accompanied by original stories but this is her first full-length novel. If the primary author’s name sounds familiar, she is the Nadiya from Great British Baking. This is her first novel, and it was written with Ayisha Malik. The book centers on four sisters – Fatima, Bubblee, Farah, and Mae. Bubblee and Farah are twins. The title is somewhat misleading as what secrets there are not really the sister’s (honesty, the one you think might be Bubblee’s never shows) but those of their family. Additionally, the book is almost wrapped about too neatly – though a couple plo If the primary author’s name sounds familiar, she is the Nadiya from Great British Baking. This is her first novel, and it was written with Ayisha Malik. The book centers on four sisters – Fatima, Bubblee, Farah, and Mae. Bubblee and Farah are twins. The title is somewhat misleading as what secrets there are not really the sister’s (honesty, the one you think might be Bubblee’s never shows) but those of their family. Additionally, the book is almost wrapped about too neatly – though a couple plot threads are left, satisfying loose. There are a couple places where you are wondering – wow, really would that happen – but not too many. There is, however, a charm about the book. Some of that has to done with the fact that Hussain doesn’t really seem to think that the reader will consider the plot twists as twists or surprises. So, there is no “see, I great the author has tricked you” feeling that is especially annoying when the author has not in fact tricked you. None of that. But the bulk of the charm rests on the sisters. With the possible exception of Farah, all the sisters are well drawn. Their interactions are beautifully rendered. Even the supporting characters – from the nudist neighbors to the father who puts hedge cuttings in the smoothie – have life. You read the book for the characters and not the plot. It is almost like watching a nice little series on the tv. Is it the deepest novel I have ever read? No. But it was a wonderful way to spend an afternoon. I love Nadiya Hussain. If you are a fan of The Great British Bake Off, you probably love her too. Nadiya was the winner in 2015, and she is, by all accounts the most popular winner in the history of the show. Charming, warm, funny, self-deprecating and gifted with a marvelously expressive face, she made all of us fall in love with her. Since winning TGBBO, Nadiya has published a cookbook (which I received as a surprise present last week from a lovely friend who lives in England), presented a TV s I love Nadiya Hussain. If you are a fan of The Great British Bake Off, you probably love her too. Nadiya was the winner in 2015, and she is, by all accounts the most popular winner in the history of the show. Charming, warm, funny, self-deprecating and gifted with a marvelously expressive face, she made all of us fall in love with her. Long story short, I found the Kindle version on Amazon, bought it, started reading it on Sunday and finished it the following day. I LOVED IT! The novel is called The Secret Lives of the Amir Sisters and it’s about, you guessed it, the Amir sisters: Fatima (aka Fatti), twins Bubblee and Farah, and Mae. Fatti is the eldest. She’s about 30 and lives at home. She’s very shy, does hand modelling, and is trying to pass her driving test. For the 15th time. Fatti loves cheese that comes in a tube, and prawns. And cheese with prawns on crackers. Maybe I am imagining the wrong kind of cheese but this sounded a bit strange to me. Farah (about 28) is married to a nice Bangladeshi guy. They live nearby and seem to lead a very comfortable and quiet life. Farah is very involved in her family’s life, she helps a lot around her parents’ house, often does the shopping and runs errands for them. Bubblee, Farah’s twin, is the black sheep of the family (in her own words). She’s an artist, a sculptor, and lives in London on her own. Which seems to be unheard of in very traditional Bangladeshi families. Bubblee is not very close to her family, she doesn’t visit or call often, and she strongly and vocally disapproves of Farah’s choice of husband. Mae is the youngest. She’s still in high school and is obsessed with social media. She’s working on a project and she films absolutely everything that happens in her family. Which of course will come back to bite her in the a**. There’s also a brother, Jay, but he’s not really around. He’s not a very good son or brother but he’s the only boy and mom and dad think the world of him. The Amir family lives a quiet and pretty happy life in a small town in England (I think near Manchester but don’t quote me on that) until there’s an accident and things begin to unravel. Someone ends up in the hospital and secrets old and new come to light, thanks in part to the presence of a cousin from Bangladesh who arrives for an unexpected visit. The sisters all cope with the events in their own particular way. Being an only child, I am forever fascinated by books about sisters, like Little Women, Pride and Prejudice or The Makioka Sisters. The Secret Lives of the Amir Sisters is a wonderful addition to this genre. It’s a sweet, gentle novel about a lovely family. It has very funny moments and also heartbreaking moments. Someone falls in love but that is not the focus of the story, it really is all about the sisters and what makes us family. Five stars. I hope Nadiya continues to write fiction. One of the important things that books do for us is provide a window into other lives. What Nadiya Hussain does in her debut novel is give us a window into a Bangladeshi family that lives in a small village in England, with four daughters (and a son) and a number of secrets. What I liked about this is how normal this family was in all of their messiness. There’s some melodrama, and some of it derives from their Bangladeshi roots, but most of it is caused by the ordinary messiness of people and their lives. We see the story from the point of view of each sister, so we get to see how each reacts to being the hero of her own story. Some are supremely confident as protagonists, and others are not at ALL. As someone who struggles with writing more than one PoV, I was very impressed with how clearly drawn each sister was. Nadiya Hussain is most well-known around these parts as the winner of season 6 of the Great British Bake Off, and here she uses her visibility to show people a window into the lives of immigrants from her community. Like her, it’s warm and funny, but with depth and purpose. Imagine every possible South Asian family stereotype you can, throw them all together and you'll get this book. 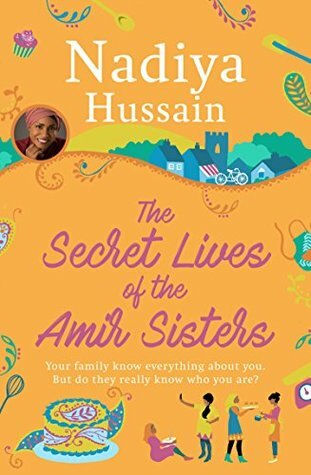 The Secret Lives of the Amir Sisters tells the story of a Muslim British Bangladeshi family and how they get by in their quiet English village. Narrated through the voices of four sisters of varying ages, framed by their contrasting and sometimes clashing personalities we get a glimpse into their daily lives. Yes this book is full of clichés and drama, and I did find that the story drag Imagine every possible South Asian family stereotype you can, throw them all together and you'll get this book. Yes this book is full of clichés and drama, and I did find that the story dragged at times but it was an entertaining read nonetheless. What I really loved was the relationships of the various characters within the story, and the overall message which was beautifully represented of what it means to be family. Surprisingly enjoyable read full of family drama. But then again, I enjoyed Ayisha Malik's "Sofia Khan" book! I really enjoyed this book, and found it gave me an interesting insight to a Bangladeshi family that lives in England, and its a fusion of Easts meets West. The Amir sisters are all very different people, and the narrative is split into all four of the sisters, for a chapter focusing on each at a time. The one thing they all have in common is they don't tell their parent's everything and all seem just a bit frustrated about how their brother appears to be the favourite at all times, despite bein I really enjoyed this book, and found it gave me an interesting insight to a Bangladeshi family that lives in England, and its a fusion of Easts meets West. The Amir sisters are all very different people, and the narrative is split into all four of the sisters, for a chapter focusing on each at a time. The one thing they all have in common is they don't tell their parent's everything and all seem just a bit frustrated about how their brother appears to be the favourite at all times, despite being male. There is Fatima who is the eldest sister, she still lives at home, and is determined she may eventually pass her driving test. She also appears to be addicted to squeezy cheese, and isn't really sure of her own identity. Then there are twins Farah and Bubblee. Farah is married to Mo, and is the daughter to tries to do the most for her parents and her family, but she is hiding things from her family. Bubblee doesn't always see eye to eye anymore with Farah and lives in London, and is more of a feminist. Lastly there is Mae, the baby of the family, who is still at school but also is doing wonders with her social media project. Mae can always be found recording her family, at least until she posts something to her blog that takes off overnight! However when disaster hits for the family they all need to pull together and with it, so many secrets and shocks come out into the open over the course of the book. Some of them I was able to guess slightly ahead of time, but I still liked seeing how the sisters rose to various occasions. Their parents are rather traditional, and arguably stereotypical, especially when it comes to constantly trying to make sure their daughters get married or have children. Early on I noticed I was giggling quite often at the dialogue, and I really enjoyed reading a family experience that is so different in some respects to my own, but equally that I could see some big similarities with my own religion. The four Amir sisters – Fatima, Farah, Bubblee and Mae are Bangladeshi Muslims in the English village of Wyvernage. On the outside, everyone looks like they have it together, but on the inside, each sister is secretly struggling. I approached this story with trepidation: Nadiya Hussain is an engaging, charming and likeable person on TV, but that does not mean she can tell a story and not all celebrities can write. I was relieved to find myself quickly immersed and engrossed in the secret lives of the Amir sisters (from the only brown family in the small community of Wyvernage). The book explores themes of identity, family, love, culture and expectations. A major crisis has repercussions for each of the sisters as secrets I approached this story with trepidation: Nadiya Hussain is an engaging, charming and likeable person on TV, but that does not mean she can tell a story and not all celebrities can write. I was relieved to find myself quickly immersed and engrossed in the secret lives of the Amir sisters (from the only brown family in the small community of Wyvernage). The book explores themes of identity, family, love, culture and expectations. A major crisis has repercussions for each of the sisters as secrets are revealed which shake the whole family to the core, and all of them must change. The sisters are all interesting and likeable, the story is fascinating and very well crafted, and there is plenty to think about. It is a very good read. In the acknowledgements at the end, Nadiya gives thanks to her writer. It is an excellent collaboration. I loved this book. Usually South Asian narratives really strike my fancy and this is a story about a Bengali family whose mindset is a lot like that of Pakistanis. There are four sisters, one's an artistic feminist, her twin has a contrasting personality, a softie eldest who is over nurtured and overfed, and the youngest is a social media fanatic. Each have chapters unto themselves and the story moves with a brilliant pace. Light and heart warming. it was so easy to relate to the characters. Nadiya Hussain was the popular winner of The Great British Bake Off two years ago and endeared herself to the nation. She has written some cookbooks and even made her own documentary charting her journey back to India which proved to make for very enjoyable viewing. Now she is turning her hand to fiction with Ayisha Malik whom it was nice to see get a mention within the introductory pages. I think there is nothing worse than 'celebs' writing books and passing them off as their own when there has Nadiya Hussain was the popular winner of The Great British Bake Off two years ago and endeared herself to the nation. She has written some cookbooks and even made her own documentary charting her journey back to India which proved to make for very enjoyable viewing. Now she is turning her hand to fiction with Ayisha Malik whom it was nice to see get a mention within the introductory pages. I think there is nothing worse than 'celebs' writing books and passing them off as their own when there has been little input at all. Here though I didn't get the sense that everything was left to Ayisha rather that Nadiya knew the story she wanted to tell and how the characters and storylines should develop. 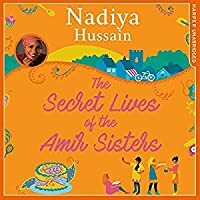 The Secret Lives of the Amir Sisters follows a dysfunctional but lovable family exploring faith and identity and how keeping secrets is not in any way good at all as slowly things start to bubble to the surface. In fact the Amir family are the only Muslim family in their small village of Wyvernage. I had never read a book before featuring an Indian family living in the UK. I had read plenty of books set in India that fall into the historical fiction genre but this was a new kind of read for me and despite there being a few lulls in places overall I really enjoyed this book. I hadn't been expecting that much from it but one couldn't fail to get caught up in the lives of the four sisters – Fatima, Farrah, Bublee and Mae. The story is told through the viewpoints of each sister in alternating chapters. I think this was the best way to tell this story as it didn't become one dimensional and we got to see the same situation from many sides as things began to develop. Fatima or Fatti as she is nicknamed by her sisters (which truthfully was infuriating for me) is the eldest sister. She hates leaving her room, she is not a happy person and stuffs her face with prawns and tubes of Primula cheese at every opportunity yet this has to be done in secret for the most part. Fatima is piling on the weight and faces a daily battle in her heart and mind. She knows things need to change and things can't go on the way they are. She should be married with a family of her own particularly as she is the eldest daughter. There is a running joke within the family that she fails her driving test all the time and several family members seem to put her down. Fatti has an overwhelming sense of not belonging, that she is on the outskirts of everything and merely looking in. Then Fatima discovers something that may well change everything both on a personal and family level. Is she willing to accept what she has discovered or will she carry on the way she has been? I felt desperately sorry for Fatima at all points throughout the story. Many of us can understand her struggle with weight although not to the extent we have tubes of Primula cheese on stand by. I felt her family just took Fatima for granted, they viewed it as being laughable her weight gain and how she relied on food. Her mother appeared to be the typical Indian mammy wanting to feed her up and smooth over the existing issues without really dealing with them. It was clear they needed to be more open. Yet at the same time when we get inside Fatima's head when she is on her own I found her to be raw, honest and open about how she was feeling I only wished she could be the same person when with her family and vocalise what was running through her head. Mae is the youngest member of the family and perhaps my favourite. She was sharp, witty and said things like she saw it with no filter which at times got her into trouble. She is very health conscious, which is in direct contrast to Fatima, and she did inflict her views regarding health a bit too much on other people. She documents the family's life on social media and always has her phone in her hand uploading the latest news or titbits of info. I felt Mae was often forgotten or taken for granted. She was always there at every pivotal point in the story and observed things quietly things that others didn't pick up on at all. Mae was funny and never held back in anyway even if she didn't say things to her family it certainly was recorded on social media for all to see. Again despite being underestimated by many she was a great character who was clever and easy to like and played an important role within the story. Bublee is 28 and an artist who specialises in sculpture, she was the one who wanted to be different from all the other family members. She moved away to London which was a wrench considering she would be away from her twin Farah. The relationship between herself and Farah has broken down since Farah married her first cousin Mo. I didn't like Bubblee at all I felt she was just very selfish and stuck in her opinions and there was no way of changing them. OK she was a twin and didn't like the direction Farah had chosen, or the choices she had made, but I felt like saying get over it she is your sister and we have to appreciate and respect our siblings choices although we may not always agree with it. When push came to show though Bubblee did step up and slowly began to loosen and warm up a bit but I never did really warm to her character. I suppose you can't really like every person you read about it in a book, there has to be that someone who just does something or comes across in a certain way that makes you hold back that little bit in fully embracing their character. The final sister is Bubblee's twin Farah who married her first cousin Mo. To me she was the backbone of the family and so selfless, always putting others needs before her own. She did everything for everybody without question and without reward or compliment and was taken for granted in my opinion. I saw a little bit of myself in her. Her parents didn't see all she did for them and what secrets she was hiding in particular with golden child their son 'Jay'. He made brief appearances in the book over halfway through and up until that point he was always referred to in awe and reverence .He was like the prodigal son and he could do no wrong in his parents eyes. In fact all this praise and fawning over Jay was very annoying and so wrong considering the wonderful children the Amir parents also had. I suppose it is often the way in families, one child gets all the credit or praise without actually doing anything and it's those who are silent and the backbone and do things without question that get overlooked. Farah like her sisters had her own secrets and problems to hide and it's only when a specific incident occurs that the family are forced to reassess everything. They begin to sit up and take notice as things come to light and the perfect façade of this wonderful Bangladeshi family begins to shatter. The only question is, with everything spilling forth, can the family go back to the unit they claim to be or will things irrevocably change for the better or for the worse? The Secret Lives of the Amir Sisters was a nice, enjoyable read and proved to provide much more of a story than I had expected. It gave the reader a good insight into a family at a turning point in their lives. I thought I would get all muddled with the sisters and chapters from different viewpoints but I didn't and I felt the story flowed well for the most part. There were one or two points where I was truly surprised with the revelations coming to the forefront and there had been brief allusions but I was glad I hadn't worked them out until the point of reveal. The book was good given it was a 'celeb' writing it and I do hope Nadiya will write more books in the future. This wasn't 100% perfect by any means but I do think it is well worth a read particularly if you want to mix up genres after having read say a number of serious books or light hearted romance as this offered a nice balance between the two. This book mightn’t feature in my top reads come the end of 2017 but it has highlighted that the author has great potential and I'll be keen to see what she may write in the future. I don't usually read books about normal family life as I prefer fantasy and adventure but I really love Nadiya and I wanted to try her book. I read it over two days whilst snowed in and really enjoyed it, the characters were all interesting and while it's not my normal choice of novel I'm glad I branched out and tried it! I enjoyed reading this book. It is a book that talks more about feelings and emotions. Needless to say, it is not a fast paced kind of reading. But there are one or two twists that brought it to life. A beautiful story of family life and the struggles of fitting in. I received a copy via Net Galley. This story follows the lives of four sisters whose family is from Bangladesh. I really liked the aspect of family that is in this book. It is very much focused on family rather than romance which made a refreshing change. Each chapter is told from the perspective of a different sister. Sometimes I had to go back to remind which sister we were following as it wasn't always clear. I thought that each sister felt very realistic, they weren't perfect characters and I received a copy via Net Galley. This story follows the lives of four sisters whose family is from Bangladesh. I really liked the aspect of family that is in this book. It is very much focused on family rather than romance which made a refreshing change. Each chapter is told from the perspective of a different sister. Sometimes I had to go back to remind which sister we were following as it wasn't always clear. I thought that each sister felt very realistic, they weren't perfect characters and they had their flaws which helped to make them more realistic. I felt that the plot was quite basic and nothing shocking happened. The writing was again quite basic but this was Nadiya's first novel and she isn't a writer originally so it was a good effort. I think that this book is perhaps aimed at a much younger audience. I liked that Nadiya drew on her background to make this story. Her family is also from Bangladesh and it was interesting to read about a different culture. Right, I bought this book a couple months ago and I forgot the summary so when I opened it, after the first pages I was like "right, this is Fatima's POV and she's a teen." Except no, she was thirty. Now, obviously there's nothing wrong with reading the POV of a thirty-year old; there is however an issue when people don't really seem to be the age they're supposed to be. From that first chapter that I became a bit reticent to finish the book, truth be told, but I already had it and it was small a Right, I bought this book a couple months ago and I forgot the summary so when I opened it, after the first pages I was like "right, this is Fatima's POV and she's a teen." Except no, she was thirty. Now, obviously there's nothing wrong with reading the POV of a thirty-year old; there is however an issue when people don't really seem to be the age they're supposed to be. From that first chapter that I became a bit reticent to finish the book, truth be told, but I already had it and it was small and the story was interesting so I kept going. Let it be said, it wasn't a chore or anything. I genuinely did like the story itself... but the characters. It's like they had these very specific characteristics in the beginning that just had to change by the end. Which, you know, is fair enough, but no one is only made of a specific trait, we all have the bad and good and if we're really going to see a character go through a journey we should from the beginning see the possibility of change. As it was, I didn't really see that, just scenes that happened with the purpose to change people and then the people changed. Basically, the characters followed the scenes and not the other way around. I really debated whether to give 2 or 3 stars. I enjoyed parts of it so I feel like giving it 2 stars is too low, but I didn't enjoy it that much to deserve a full 3 stars. So think of this as a 2.5 stars. I was intriguing to read this, being the debut from Bake Off winner Nadiya. The story of four sisters, young Bangladeshi women trying to make their way in the world, live up to their parents expectations and whose family is brought together when tragedy strikes. Initially I enjoyed this book but sadly after about half way I started to lose interest. There just seemed to be something lacking for me and I couldn't connect with any of the characters. The story is told from the perspective of each si I was intriguing to read this, being the debut from Bake Off winner Nadiya. The story of four sisters, young Bangladeshi women trying to make their way in the world, live up to their parents expectations and whose family is brought together when tragedy strikes. Initially I enjoyed this book but sadly after about half way I started to lose interest. There just seemed to be something lacking for me and I couldn't connect with any of the characters. The story is told from the perspective of each sister but it all seemed to blend into one voice rather than four strong individual voices. However I did like the cultural aspect of this book. I enjoyed learning about the Bangladeshi way of life. It was fascinating to see the cultural differences and I could hear Nadiya's voice speaking from experience as I was reading. But there just wasn't a spark for me. Having watched Nadiya win The Great British Bake Off I eagerly requested this book. It follows four sisters with differing personalities with a Bangladeshi background. Nadiya said she was keen to write the type of book she would have been keen to read growing up and that she wanted to write about what she knows. Apparently she has been writing since she was a young girl and has said that there are plenty of stories that could see the light of day! The characters were fairly well drawn- you got to Having watched Nadiya win The Great British Bake Off I eagerly requested this book. It follows four sisters with differing personalities with a Bangladeshi background. Nadiya said she was keen to write the type of book she would have been keen to read growing up and that she wanted to write about what she knows. The characters were fairly well drawn- you got to know them well. They each have their own struggles and worries. I did love the cultural detail throughout the book- as I always love a book that educates you in some way and this was a fascinating aspect to the book. The storyline was fairly slowpaced but it was an enjoyable read and I would try her next book. I really wanted to like this book. But there was so much going on plot wise, it made it difficult to connect with the characters or care about what was happening to them. It reminded me of the problems of "The Other Half of Happiness" by Ayisha Malik because the downside of that book was that so much was happening, it was difficult to hold onto the plot. Unbelievably slow book. There was absolutely no resolution, and overall a big disappointment. I liked the concept of a muslim family and the things they get up to, but secret lives? What secret lives? I think this book wanted to be complex but it fell flat. I was trying really hard to get involved in this story but couldn't. Stereotypical characters, predictable twists & worst of all, pace slower than a turtle. ‘The Secret Lives of the Amir Sisters’ follows the journey of four sisters - Fatima, Farah, Bubblee and Mae. Each woman faces similar challenges of seeking acceptance and fighting for change, but it’s only a family tragedy that forces them to come together. They are pushed to let go of past resentments and learn about their faith, themselves, each other, forgiveness and to bond as a family. 1. I didn’t know that the author had won ‘T ‘The Secret Lives of the Amir Sisters’ follows the journey of four sisters - Fatima, Farah, Bubblee and Mae. Each woman faces similar challenges of seeking acceptance and fighting for change, but it’s only a family tragedy that forces them to come together. They are pushed to let go of past resentments and learn about their faith, themselves, each other, forgiveness and to bond as a family. 1. I didn’t know that the author had won ‘The Great British Bake Off’ in 2015. I picked up this book based on my local library’s suggestion. Nadiya’s writing has a warmth and level of professionalism. She has stated in the acknowledgments that she’s had help with her writing process by another author which may have helped achieve this in her debut novel. 2. The book has a lot of common clichès - a rebellious modern muslim woman, an obedient daughter, the youngest being ignored, a selfish artist, etc. The story repeats actions and scenarios throughout the first half of the book and annoyingly doesn’t get to the point till the second half. I picked up this book because of the GBBO and I liked the sound of the summary. When I saw it in my library, I snatched it up. There were good and bad points. I really liked all the characters, especially the four sisters. Thanks to the switching POVs, you got to know each of the sisters' perspectives and you could empathise with each and every sister. Bubblee's words sounded insensitive from Farah's perspective but in her own POV chapter, you could see what she meant and why she said it. Mae ma I picked up this book because of the GBBO and I liked the sound of the summary. When I saw it in my library, I snatched it up. There were good and bad points. I really liked all the characters, especially the four sisters. Thanks to the switching POVs, you got to know each of the sisters' perspectives and you could empathise with each and every sister. Bubblee's words sounded insensitive from Farah's perspective but in her own POV chapter, you could see what she meant and why she said it. Mae may look obsessed with social media but in her own chapters you could see that she cared about her family, but she didn't know how quite to fit in. And poor Fatti, trying to find somewhere to fit in only to find it was never a place she had to go. The main plot was interesting and I liked how it brought everyone's stories together in the end. What I think let the book down the most was the setting. The two main settings are the village where the sisters live and Bangladesh but we don't see either of these settings very much at all. In the big climax of the book, the fact that they're well-liked in the village becomes a plot point but we don't really see it up to them. The book focuses a lot on the family, which I don't mind, but I thought there would be more interaction with people of the village or people outside the family in Bangladesh. We saw a few hints of the culture clash Fatti experienced but it was never really focused on. Growing up in the English village of Wyvernage, the Amir family are used to being the only Asian family around. Each of the sibling has their own issues: Fatima is overweight and cannot seem to pass her driving test even with the help of her long-suffering instructor Ash; Farah is happily married but cannot get pregnant; Bubblee has moved to London and is determined to avoid having a marriage arranged by the family; only son Jahangeer mysteriously will not say what his job is and is in contact r Growing up in the English village of Wyvernage, the Amir family are used to being the only Asian family around. Each of the sibling has their own issues: Fatima is overweight and cannot seem to pass her driving test even with the help of her long-suffering instructor Ash; Farah is happily married but cannot get pregnant; Bubblee has moved to London and is determined to avoid having a marriage arranged by the family; only son Jahangeer mysteriously will not say what his job is and is in contact rarely; and youngest daughter Mae is obsessed by social media. When Farah's husband is involved in a serious accident the family secrets are revealed and the siblings relationships are tested. Hussain was born to a British Bangladeshi family in Luton, where she grew up. She developed her interest in cooking while at school and largely self-educated herself in cooking by reading recipe books and watching instructional videos on YouTube. She married and mo Nadiya Hussain is a British baker, columnist, author and television presenter. The Secret Lives of the Amir Sisters is her debut novel.